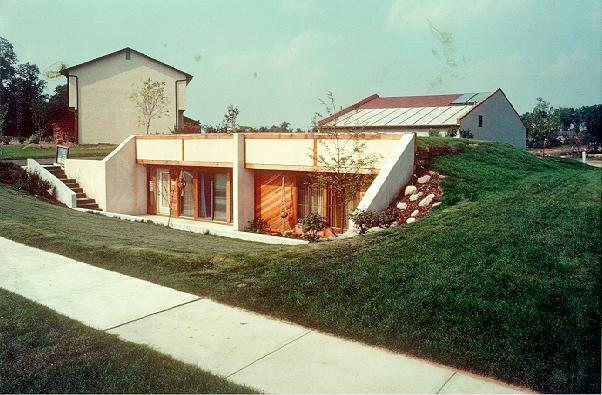 From the front page of the Dayton Daily News "Home Section" another award winning home designed by Rick Ohanian, in 1980, this time a "berm" type home with a backside solaratrium. Ron and Ruth Schroeder of Fairborn can celebrate Earth Day this year by staying at home. Their house at 1940 Armstrong Rd. is nestled in the earth--dug into the side of a hill on their wooded, five-acre lot. It's one of a few underground or earth-sheltered homes in the area. 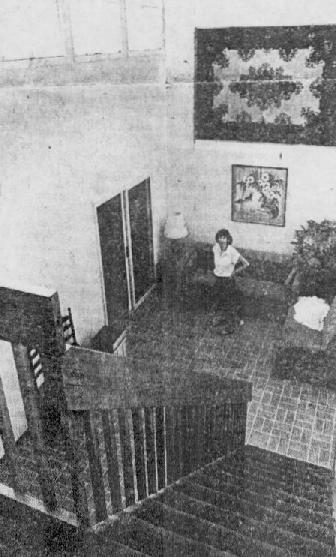 The word "underground" conjures images of cellars, but Mrs. Schroeder said their home isn't like that: "Our house is more open and airy than the house we had in the city (East Dayton)." The house isn't palatial, but it has 1,700-square-feet of living space. The Schroeders decided to move to the country in order to lead a more self-sufficient life-style. Their earth-sheltered home fits the scheme by cutting down their energy consumption, using two forms of solar energy for heat and the ground as natural insulation. A visitor entering through the front door finds himself on a balcony overlooking a room with a 24-foot ceiling--what the Schroeders call the"solar atrium." THE ATRIUM RISES out of the ground, the top half of the south wall made of 192-square-feet of glass. The atrium is a passive solar collector. The windows let in sunlight but keep heat from radiating back out, trapping the sun's warmth like a greenhouse. Warm air collects in the upper part of the atrium, and a ceiling fan helps circulate it through the house. The Schroeders were thinking of moving out of East Dayton when plans for an underground home in Mother Earth News magazine caught their eyes. Mrs. Schroeder was sold on it immediately. "I just liked the idea of being more self-sufficient," she said. But she said it took a visit to a Columbus underground home based on the Mother Earth News design to convince her skeptical husband. THE COUPLE'S HOME isn't entirely underground--the atrium is partly above ground and the roof of the rest of the house is exposed. Still, most of the living space is below the frost line, where temperatures hover around 55 degrees Fahrenheit throughout the year. That and rigid foam insulation and 10-inch thick concrete walls keep the home cozy. The Schroeders didn't go completely underground simply for economic reasons. The added weight of earth overhead would have required stronger structure and more concrete--about $10,000 worth, Schroeder estimated. "It would have taken a long time of using less fuel to save that much money," he said. The Schroeders harvest locust trees on their lot for firewood. But it's not always needed. "On days when we have sun all day long, we don't have to burn any wood until evening," Schroeder said. "Even on days when the temperature is only 10 degrees outside, Ruth runs around in shorts and bare feet." BRICK WALLS IN the living and dining areas absorb heat during the day and release it during the evening, acting as a passive solar heat storage system. Mrs. Schroeder estimated they have burned three cords of wood since they moved into the house last November. 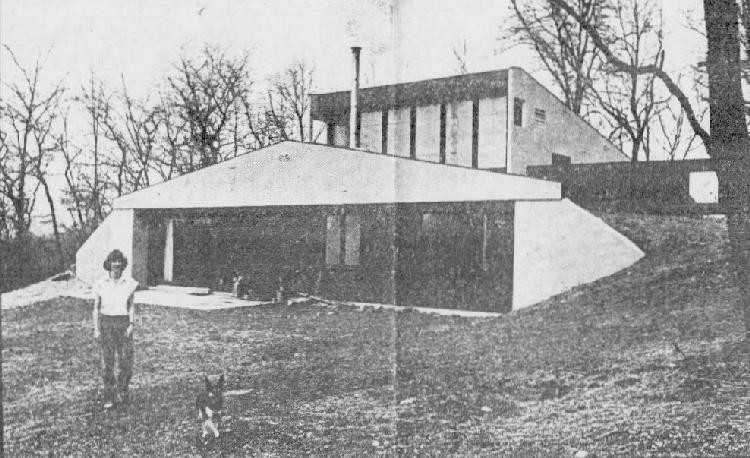 The Schroeders contracted with Shelterra, an offshoot of Century Concrete in Springfield which has built other earth-sheltered homes in the area, to modify their plans for a less expensive house. They hired Robert Nichols, a custom home builder from Beavercreek, to build the house because he was a friend of the family and they were familiar with his work. Financing was tricky. Lenders aren't eager to make loans for unconventional homes because they are leery of their ability to resell such a home in the event that they would have to foreclose on a mortgage, Mrs. Schroeder said. "A lot of the places we talked to said we shouldn't even bother to apply because they didn't make loans for underground homes." SHE SAID THEY avoided disappointments by checking out lenders' policies before applying. When they finally chose Home Federal Savings and Loan of Xenia, they made a special effort to sell the lender on their idea. They added an electric furnace o the plans even though they felt the wood stove would be adequate. They figured it would increase its resale value. Schroeder, a commercial artist, drew a color sketch of the proposed house to show that it would have aesthetic appeal. They also stressed the energy-saving features of the house, noting that the money they would save from reduced heating bills would strengthen their ability to meet mortgage payments. The savings and loan bought the idea and approved their mortgage.